Are you polluting your data lake? Recipes for building automated ingest pipelines that implement continual in-stream sanitization so that data lands in stores ready to consume, regardless of the complexity of collecting it. Methods for making your pipelines resistant to data drift - the inevitable changes in schema, semantics and infrastructure that breaks pipelines. Open source tools that allow you to create and maintain these pipelines with little to no hand coding. Arvind Prabhakar is CTO and Co-Founder of StreamSets, a Big Data startup headquartered in San Francisco. He is an Apache Software Foundation member, former PMC Chair for Flume and Sqoop projects, PMC member on Storm and MetaModel projects. 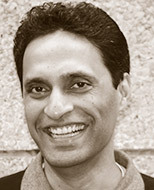 Prior to StreamSets, Arvind was director of engineering at Cloudera and software architect in the core platform engineering team at Informatica.